Product application: Granules like sugar, tea, peanuts, instant drink powder, mouth freshner, namkeen, puffs, kurkure, baby rings etc. Roll width: To be conveyed in mm. Our in-depth knowledge and industrial expertise enable us to manufacture and supply a distinguished range of FFS Machine. 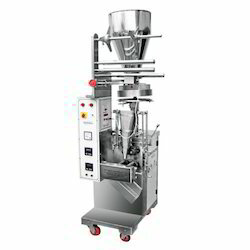 Use :FFS machine is used for packaging diverse material such as liquid, semi-liquids and pastes in air-tight pouches. 40-80 sachets per minute approx. Single Phase, 230 Volts, 50 Htz. 775mm (W) x 950mm (L) x 1500mm (H) Approx. Center / Three side / four side seal pouches. - Used for packing powder, snack food, dry fruits, shampoo, grease, oil, wine, cream, etc. 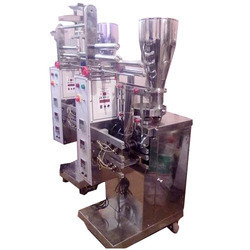 We are a unique name in the industry to provide our prestigious clients an exclusive range of Filling Packaging Machine. The Form Fill Sealing Machines we manufacture, uses flexible, heat seal-able plastic film to form packaging that can be filled with a product and sealed later. Known for their high speed and cost effective packaging nature, these machines are corrosion resistant and abide to laid industry norms & standards. With our in-depth knowledge of this domain, we are actively engaged in manufacturing an excellent quality range of Pneumatic FFS Machine. Sealing type: 3/4-sided seal, center seal. - Max Width: 180 m.
- Max Width: 300 mm.